Here at the Meadows Institute, we are committed to helping a New Economy take shape—one that ensures the health of our ecosystems, values the needs of our communities, and provides for people’s wellbeing. Our publication focuses on the emergence of the New Economy in our home base of Vermont, USA. Already, there the beginnings of a New Economy across Vermont, from the preservation of our working lands and the establishment of socially-responsible businesses to opportunities for investing locally and new ways to measure our progress. Vermont’s New Economy focuses on both numbers and stories from across the state. The numbers provide a snapshot of how Vermont is doing, while the stories that accompany them illustrate some of the innovative approaches already working here. Through these numbers and stories, we hope to provide a “sense of the possible” in designing strong and sustainable economies. 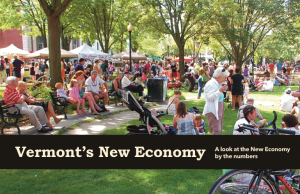 Vermont’s New Economy was published October 2013 in conjunction with Vermont’s New Economy Week October 10-20, 2013. For more information, please contact sarah donellameadows org.